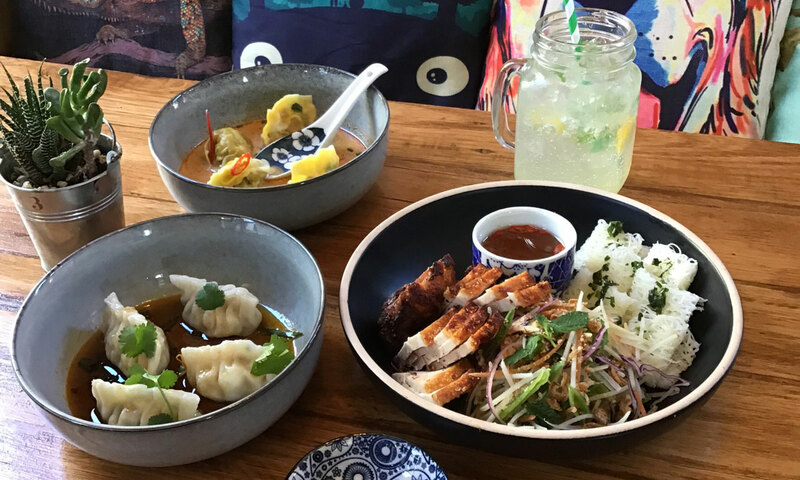 A small Vietnamese-inspired restaurant in an historic former blacksmith’s building is one of several new ventures bringing a fresh flavour and buzz to the Fleurieu Peninsula township of Aldinga. Sea-changers and first-time restaurateurs Trinh and Mike Richards admit their friends in hospitality thought they were a bit mad to open up a restaurant. It’s a notoriously risky industry, but they were ready for a new challenge, especially one that would enable Trinh to pursue her love of cooking – something she inherited from her mother, who came to Australia from Da Lat in Vietnam more than 30 years ago. The Richards decided to test the waters last summer with a pop-up at the Blacksmith Hub on Old Coach Road at Aldinga, selling mainly cold rolls and Vietnamese salad bowls. Named The Little Rickshaw (TLR), it was open only on Sunday afternoons, and quickly gained a following. “It was way better than expected – the feedback was good,” says Mike, who has experience in hospitality, including managing pubs. Now, The Little Rickshaw has evolved into a fully fledged restaurant – albeit a small one with just 15 seats inside and around 20 outside. Since last month, it has been open Friday and Saturday nights, and Saturday and Sunday during the day. The menu has also expanded, including items such as steamed bao buns; kaffir lime chicken wontons; kohlrabi and watercress salad with crunchy tofu and avo, and chargrilled lemongrass chicken and rice. Favourite dishes include the salt ’n’ pepper eggplant served with a black sesame aioli (a must-order), Ha Noi spring rolls (made with rice paper) and delicious crackling roast pork belly with green papaya and mint salad. A selection of TLR’s tasty Vietnamese dishes. In recent months, several other new businesses have also opened in the Aldinga area, including the nearby wholefoods-focussed Nourish Me Happy Café and, on the Esplanade, SOURC’D Wine and Coffee Bar (read more below). They add to a thriving local food and drink scene that includes the popular Rosey’s café/restaurant, Maxwell’s Grocery, Fall From Grace wine bar, and Goodness Coffee Co roastery and coffee bar. The Blacksmith Hub which houses TLR and two other businesses – Spoilt Rotten hair salon and Goodness Coffee – has an interesting history which dates back to the 1800s, when it was used as the home and workshop of a local blacksmith and coach builder. 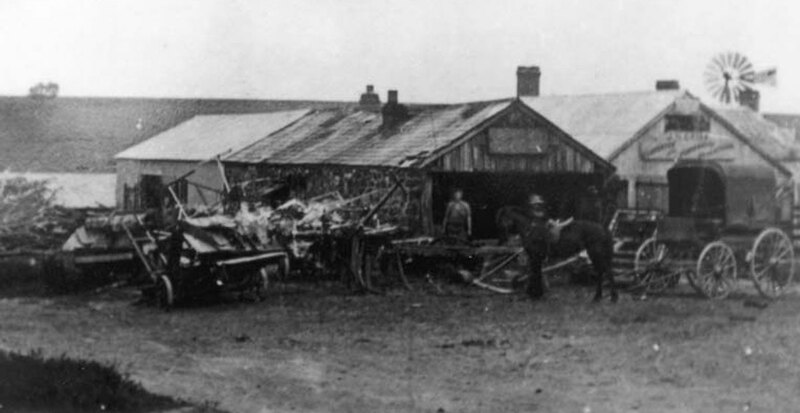 Later, it was taken over by a family of carriage builders and funeral directors, then used as a mechanic’s garage. In 2009, Helen McGrice and her partner Ashley Hanlon bought the then run-down buildings, with McGrice’s skills as a stonemason coming in handy as they worked to transform it through what she describes as “a labour of love”. The pair say that as Aldinga has grown, many people have approached them wanting to run businesses from the hub. The space now leased to The Little Rickshaw was previously a gift shop, and turning it into a restaurant was also a labour of love for the Richards, who have created a welcoming, rustic dining space that is in keeping with the building’s history. The décor features a mixture of corrugated iron, raw stone, and original and recycled timber, complemented by a blue feature wall, colourful cushions and – in pride of place near the entry – a framed photo that connects back to Trinh’s family. “Our tea and our coffee is actually from the family farm [in Vietnam], so up on the wall is a picture of my grandmother’s coffee and tea plantation – it’s the view from her balcony,” she says. The photo of Trinh Richards’ grandma’s farm in Da Lat, Vietnam. Trinh, who previously worked in employment services before moving to Aldinga, got her early cooking inspiration from her mother, Loan. Family dinners generally featured a banquet of Vietnamese dishes, and in a similar way, much of the food at The Little Rickshaw is made to be shared and enjoyed in a relaxed setting. Now, Loan helps her daughter in the kitchen at TLR, buying most of the fresh ingredients and driving from her home in Modbury to Aldinga to assist with prep and service of a menu which reflects a fresh, contemporary take on traditional Vietnamese cuisine. “She’s impressed with some of the recipes that I’ve created or which we’ve created together,” Trinh says. 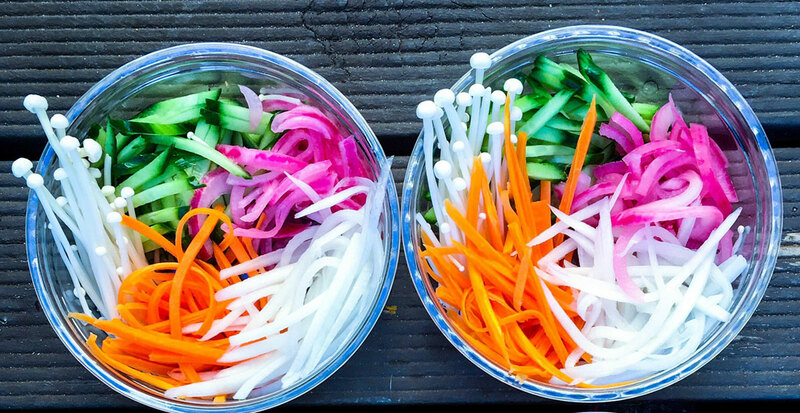 Fresh food focus: The Little Rickshaw pickles. For now, Trinh and Mike both still have other jobs, but if TLR continues to thrive, they hope to eventually extend their opening hours – and maybe even the restaurant space. “We love Aldinga,” Mike says. The Little Rickshaw can be found at 24 Old Coach Road; check the Facebook page for opening hours and updates. SOURC’D Wine & Coffee Bar: This lively new wine bar and café on The Esplanade at Aldinga Beach has espresso martinis and South Coast Brewing Co craft beer on tap, cocktails and “tipsy milkshakes”, and a revolving selection of local boutique wines. It also serves brunch and lunch, as well as platters, nachos and a range other dishes in the evening, highlighting regional produce. Nourish Me Happy Cafe: “Handcrafted wholefoods” are the focus of this little café, which recently opened in a tin shed just a short walk from TLR on Old Coach Road at Aldinga. It offers a selection of vegan and raw-food dishes – including raw nachos, vegan pancakes and raw sweets – but it’s not completely dairy or egg-free. And then there’s the drinks – everything from a “velvet latte” (with an organic beetroot chai infusion) to a “sticky chai brulee”. We hear they may bring one of the outdoor pizza ovens back into service over summer, too. Cooee Arthouse: This intimate little live music, film and community venue opened earlier this year in a shed behind Old Coach Road. With a rustic/vintage vibe – and, in the cooler months, an outdoor firepit – it hosts regular gigs as well as screening arthouse films and hosting workshops. Cooee doesn’t have a liquor licence, but it does serve excellent chai and cakes. Fridays After Five: This laneway love-in isn’t new, but it is returning for the spring/summer season from November 30. Held every Friday evening behind the Home Grain Bakery on Old Coach Road, it includes live music, craft stalls, food trucks and a bar. Keep an eye on the Facebook page for updates.